​​​​SAN MARCOS – An Austin developer has changed course on plans to revamp a San Marcos shopping center. Since taking control of Springtown Center in 2014, Endeavor Real Estate has landed a number of high-profile tenants to fill what was, at the time, a sickly strip mall that was only 10 percent occupied. 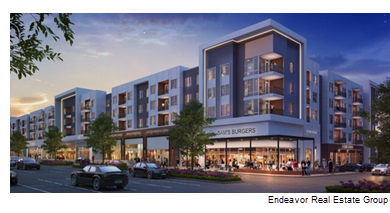 Now plans include demolishing a chunk of the center between Chuy’s and the former Target store that’s now home to Gold’s Gym and The Spot to make way for a multi-story apartment building that will have 233 units with 32,000 sf of ground-floor retail space. The project will be called The Lyndon after former President Lyndon B. Johnson who attended nearby Texas State University back when it was known as Southwest Texas State Teachers College. The 233 apartments will have a total of 515 beds, targeting a mix of Texas State students and non-students. It is expected to be completed in mid 2019. ​Check out ​more mixed-use stories across Texas.